Some of our older code examples, including many that I have authored on my blog have been using raw query execution against the Google APIs. This is undesirable and is absolutely not a best practice because you will not benefit from the convenience and reliability that comes with using methods on the API. The beauty of the Google APIs is that they use a discovery service that allows Google and third parties to generate updated packages on the fly for developers to consume in their target languages. What this means is that as the APIs change, the client libraries will automatically be updated to support these changes. Furthermore, these client libraries are owned and tested by Google making them much more stable and reliable than using raw access to the API endpoints. In this post, I’ll show you first a few bad examples for queries and will show you better ways of accessing Google’s APIs. The Google API clients support performing raw execution against the Google APIs using appropriate network stacks for that particular client. This is great design because client queries can share the same execution code and benefit from improvements in caching, performance, reliability, and so forth. Additionally, the API will manage authorization and will manage your bearer token for you. However, accessing the APIs in this manner requires you to parse and manage JSON objects which can introduce bugs and support issues for you, the developer. What this code is doing is directly POSTing JSON data to the API endpoint. This is undesirable because there are a number of ways that things can go wrong and you must write loads of unnecessary and difficult to read code. In addition, you have to stringify the API call when you make it and also parse the response from the query. // For now, just can cry about it..
As you can see, this code is even less readable than the first set of code! I’m even adding an ugly and blatantly terrible error handler that lacks remediation for the response issues. The code is super fragile: changes at multiple points in the process will introduce bugs in my demo. Do not access the APIs this way. See how much better it is! This code is even doing MORE than the other code in fewer lines. You get nice objects and methods for all of the operations performed on Google+ and the code will be updated from Google if anything ever changes. By accessing the API in this manner, you will be getting all of the client library updates by loading the client library from Google and will get a reliable means of accessing the API functionality. The Google+ quickstarts show how to use the client libraries in a number of languages, this is a great way to get started with understanding the relevant patterns for your language of choice. Also, this is a great way to learn how to perform the operations in a language you understand less because the samples are virtually identical in all languages. You can also download the Google+ API clients from the Google+ developer pages that are targeted to Google+. For certain languages such as C# and Java, the client libraries must be generated, so occasionally it may be a good idea to update your clients if you’re using these languages. 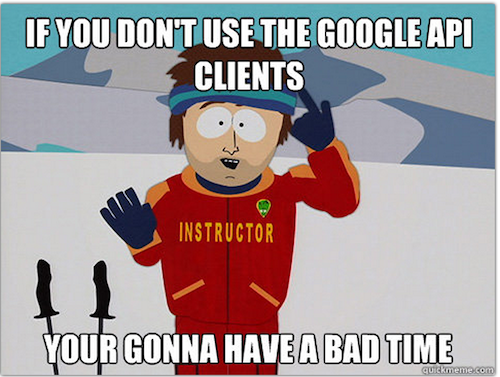 Have fun accessing the APIs, and be sure to do it the right way, using the freely available clients! @ggus this is a great post. Are you saying using the “idea” of xhr/xttp request is completely wrong ? In my current situation I am building off the calendar api into a chrome extension. The only real solution for me is to build it as a xhr/xttp request. @Devan, I’m not saying that XHR is wrong, I’m just saying that you should be using the client libraries as opposed to using your own or directly making an XHR. The big problem I see is that the client lib versions are so confusing while the HTTP documention is straight up. I’m with you though, the client LIB is easier to get setup from the start. Nice artice. Thanks for the read. Thanks for the comments too, the key for me with libraries like this is having a solution that is easier to start with than the protocols, examples help to make it so.